While it's Lindsey's About a Girl series I particularly adore, I love that she's ventured into stand-alone novels now as well as that means I can pick up her latest book without having to reread any others to refresh the storyline (I read a LOT of books, and no matter how much I love them I don't tend to remember the story very well by the time the next one in the series is published). One in a Million is her latest novel and it tells the tale of Annie, a savvy social media specialist who together with her best friend has set up her own business revolutionising the relatively new world of digital marketing by working with influencers, bloggers, and generally making the most of new marketing channels that more established marketing agencies tend to overlook – or even look down on. As if running your own business in marketing as a woman wasn't tricky enough already; Annie feels she always has to proof her merit, not in the least in front of Charlie who runs a more traditional marketing agency from the same office building. So when her role and skills are questioned once again, Annie makes a bold bet: she'll make whoever walks through the door of their office next Instagram famous in 30 days. It's just Annie's luck that the fated next person to walk through that door is Dr Samuel Page PhD, a stuffy historian and a very reluctant social media user. She has just one month to use her questionable powers of persuasion to turn Sam's perception around and prove once and for all that she's an expert digital marketer, while at the same time trying to keep her struggling business afloat because their clients are slow in paying their invoices while Annie's bills keep piling up. But even with her digital marketing skills and sheer determination, is the bet impossible to win? 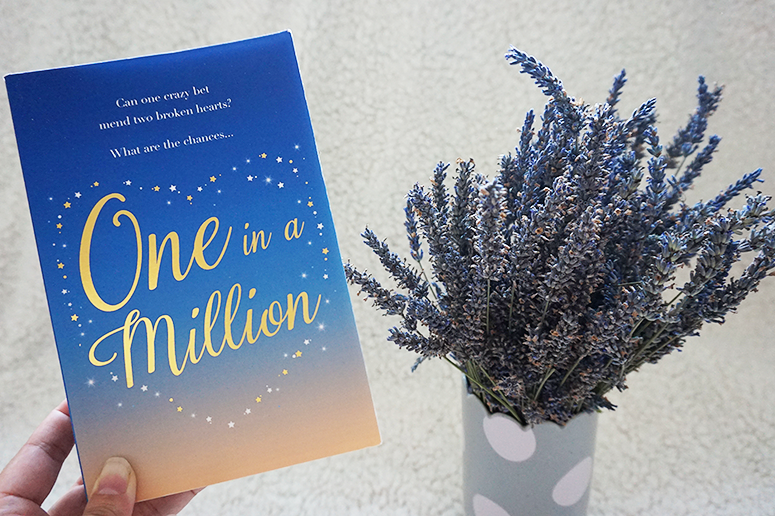 One in a Million is such a delightful summery read; it's charming, romantic and with a lol a minute it's entertaining on every single page. Annie may have a strong competitive streak but she's still a super loveable protagonist and one you cannot help but root for even when her situation seems impossible to come back from. It was also great to see a main character in a digital marketing role as I work in this space in my day job, so I was really able to relate to her work and the skepticism she receives from old-fashioned people that aren't quite able to keep up with the rapidly changing industry. The fact that Annie is doing such a great job trying to convince them otherwise was empowering to read – you go girl! And then there is the super cute romantic romantic storyline, excuse me while I swoon for a moment. If you read a lot of novels within this genre then the storyline developments may not have come as a great surprise to you but that doesn't it make it any less of a joy to read. Yes, it may be a tad predictable but let's be honest we're all hooked because of the ups-and-downs in the journey, not the inevitable happily ever after destination. And the journey is a great on. There is a reason Lindsey Kelk is one of my absolute favourite women's fiction authors, and with One in a Million she has reaffirmed once more why I love her so much. If you want hilarious, no-nonsense rom coms with empowering 20 and 30-something leading ladies, then look no further than Lindsey's fabulous novels! One in a Million is published by Harper Collins and you can get your copy now from Foyles or your own preferred retailer. 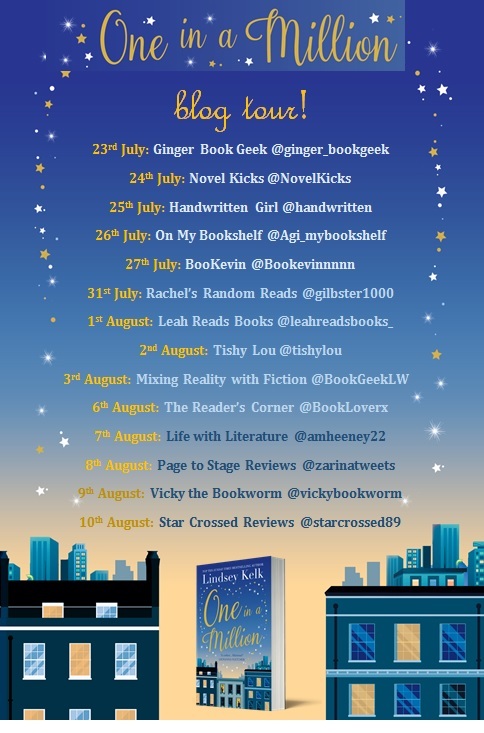 This review for One in a Million is a part of the official blog tour for, make sure you check out the other stops too for more awesome posts and reviews!